(WINDSOR, ON) – With Omar Strong out of the lineup with a lower body injury, the Windsor Express welcomed back to the fold Kevin Loiselle for their February 23 tilt at home against the Kitchener-Waterloo Titans. Both teams were fresh off wins against divisional rivals London and St John’s in their previous games. Three minutes into the game and the score was 6-2 for Windsor as the two sides found it difficult to find their range. Once the players warmed up, the buckets started dropping with the expected regularity. Kitchener’s Tramar Sutherland led the Titans attack with both points from the paint and from downtown, to keep them marginally ahead of the Express. Logan Stutz worked hard inside for the home team while the fans showed their appreciation for each Damontre Harris slam. The audience really came alive when Loiselle’s name was announced upon his entry to the game. By the end of the opening period, KW was enjoying a 30-24 lead. Sutherland was top dog for the Titans in the quarter with 13 points while Stutz (7) and Shaquille Keith (5) accounted for the spread out offense from the Express. The Express can take advantage down the stretch of the regular season, with multiple back-to-back games scheduled, by having a highly dependable bench that can turn the momentum of the game. What seemed to be an odd selection of players on the floor for Windsor appeared to confuse the Titans defense. A hard-nosed edge developed with the arrival of Sefton Barrett, backed up by Loiselle, Braylon Rayson, Erik Parker, and Chad Frazier. Barrett stood out by dropping a trey and then getting back on defense to hand out a monster block on Greg Morrow. With 3 minutes left on the clock in the half, Windsor had outscored KW 23-8 in the quarter. By the half time horn, Windsor was in front 53-47. Windsor started the 2nd half with a Harris steal, bucket, and foul. The pace, though, seemed to slow as the Kitchener and Windsor quietly worked their way through the quarter. The Express riled up the crowd when Maurice Jones hit from deep followed by Stutz dropping his own trey. 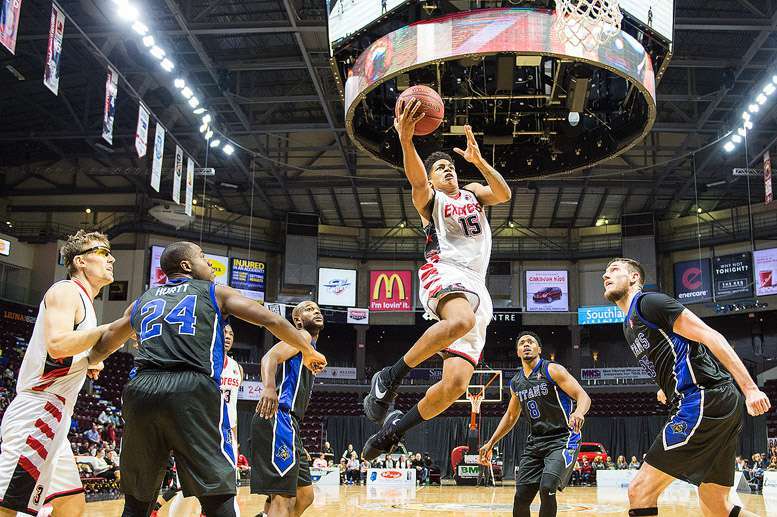 After all was said and done in the quarter, the Express continued to enjoy a 9-point lead while putting up 33 points to Kitchener’s 30. The Titans opened the scoring in the final frame, going out on a 9-9 run amongst a whole lot of missed opportunities. Most of Windsor’s points came from the line as they drove the lanes to draw the fouls. Rayson then bucked the trend by hitting from downtown to push the Express over the 100-point mark. Suddenly, the opponents caught their second wind and started running end-to-end, racking up the points. Kitchener climbed to within 3 of Windsor, but a deep foul on Rayson put him at the line for three. He connected on 1-of-3 to create a 4-point buffer for Windsor. Another foul allowed Loiselle to increase the margin to 6. Justin Hurtt immediately cut that in half with clock at 45.5 seconds. Windsor had seven players in double digits as head coach Bill Jones spread the minutes around. Point guard Jones led the offence with 17, but was closely followed by Stutz and Loiselle with 15 each. Frazier, Keith, and Rayson all ended the match with 14, and Barrett pulled into the station with 11. In fact, Coach Jones received 43 points from the bench as his starters were kept fresh for immediate use. Hurtt scored the game-high 26 for Kitchener while Sutherland (24), Derek Hall (22), and Ed Horton (14) also figured in the scoring. However, after that two players managed 6 points in the Titans focused offense. The Express won the game at the penalty stripe, hitting on 81.3% while Kitchener managed just 60% on the game. Windsor and the Titans go head-to-head again tonight Kitchener.